Everyone loves salted caramel and this Easy Salted Caramel Sauce Recipe is the only one you need. Homemade is best and with just 4 ingredients and 10 minutes, you can have this sauce on hand whenever you want it. This a luscious, thick caramel sauce recipe that I’ve had on the site since January 2014. The sauce was used as a delicious treat in the center of Chocolate Caramel Turtle Cupcakes. With fall just around the corner and I’m thinking of comfort food and warm desserts, it always makes me want salted caramel everything. 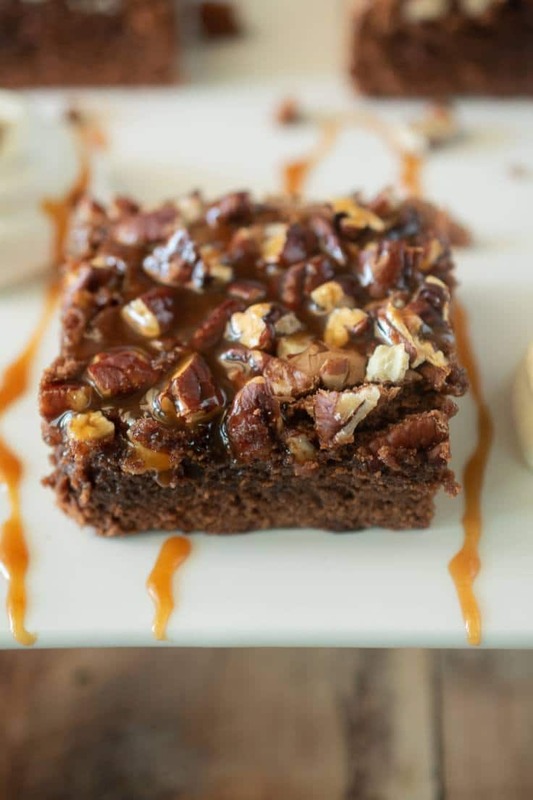 Last week, I made Salted Caramel Pecan Brownies which is pretty much the ultimate use of this easy caramel recipe. These brownies did not last long. 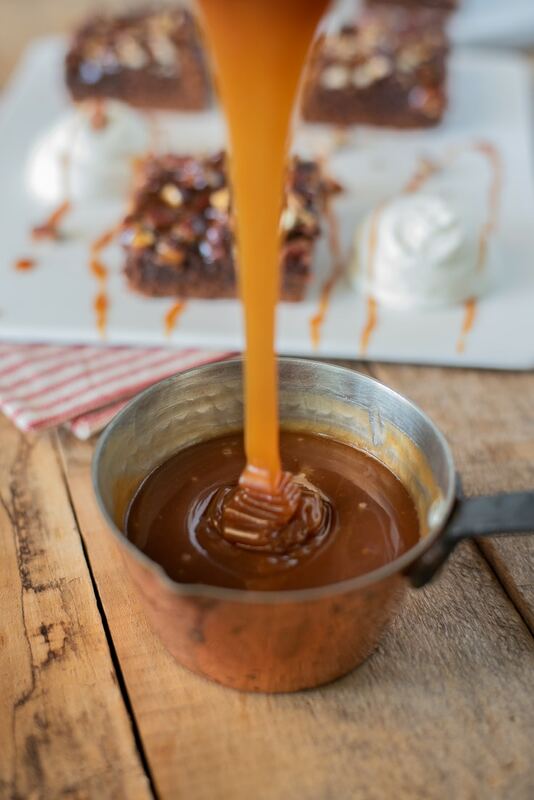 Scroll down to the bottom of this post to see more delicious recipes using this Easy Salted Caramel Sauce. 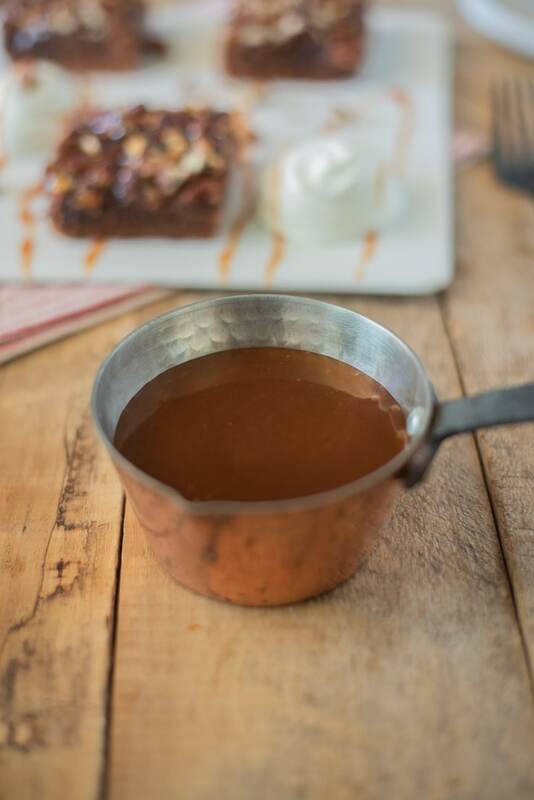 I have a few tips to help you as you make the caramel sauce, starting with the heating of the sugar. It is important to not have the heat too high while the sugar is cooking. When you see the sugar bubbling, this is the stage you want to keep it at until it until it turns dark amber in color. Don’t stir, this will cause the sugar to crystalize. Once the sugar has reached the dark amber stage, you must remove it immediately from the heat as it can turn very quickly from the perfect color, to too dark. Stirring the heavy cream into the sugar may seem scary, because it will bubble because of the dramatic temperature difference between the sugar and the cream, but it will not bubble over, just keeping stirring. The key is to add the cream in a slow, steady stream so the sugar does not cool down too quickly and solidify. I like to transfer the sauce from the pan to a pouring jug to cool, this makes it easier to transfer the sauce to a jar. 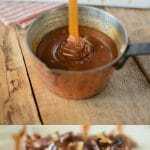 If you’ve tried this Easy Salted Caramel Sauce Recipe or any other recipe on the blog then don’t forget to rate the recipe and let me know how you got on in the comments below. I love to hear from my readers! You can also FOLLOW ME on FACEBOOK, TWITTER, INSTAGRAM and PINTEREST to see daily recipe updates. 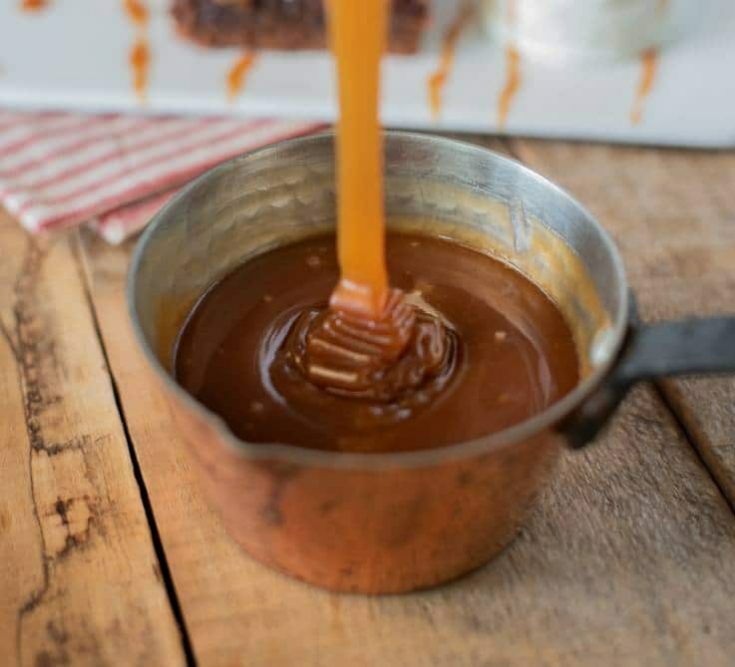 What can I say about this salted caramel sauce other than it is one of the best sauces for chocolate desserts, ice cream sundaes or licking off the spoon for a little sweet treat. To a medium saucepan add the sugar and water. Heat over medium-low heat until sugar dissolves. Increase the heat until the sugar mixture bubbles and continue to cook until it turns amber. Immediately remove from heat. Whisk in the heavy cream (it will bubble) until well mixed. Stir in the butter and the salt. Allow to cool. The sauce can be stored in a tight container for up to 2 weeks the refrigerator. This looks so delicious but I love everything caramel! One of my favs! Salted caramel will never go out of style. This recipe will be so useful for so many things! Thanks for sharing! Great question Alaa. I’m not a coffee drinker either and it’s not too strong for me, it’s very mild. You can substitute with a teaspoon of vanilla extract. Thank you! 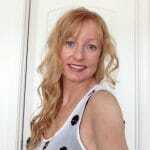 Oh my, Janette! Love salted caramel ANYTHING! This sauce looks amazing! I’m going to have to whip up your chocolate caramel turtle cupcakes sometime soon!!! I’m planning to make homemade peanut butter and layer it in jars with your sultry salted caramel. It’s going to be epic!!!! I LOVE salted caramel. This looks divine. I could fill my swimming pool with it and dive right in.